Putting Additive Manufacturing to work across critical rapid prototyping, custom tooling and part production processes, Stratasys is bringing to market advanced elastomers and enhanced materials for its leading FDM and PolyJet machines. Enabling customers to make it today with 3D Printing, the FDM elastomer solution is intended to provide manufacturers with new levels of elasticity, durability with true soluble support – while advanced colors for PolyJet drive enhanced realism to transform legacy design and prototyping processes. Empowering engineers with fast, accurate, and functional elastomers, customers can now produce parts with unique resilience – with an ability to greatly stretch or compress without losing shape. 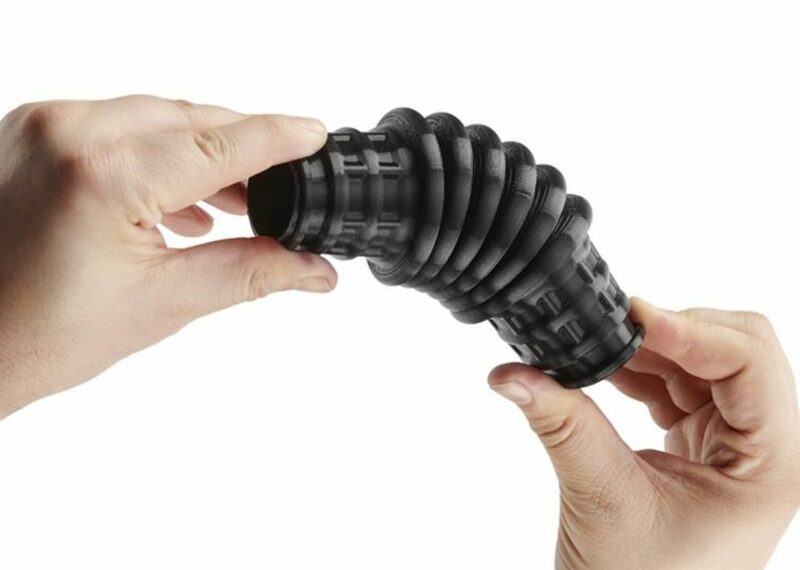 Offered across the F123 3D Printer platform and via North America’s leading service provider, Stratasys Direct Manufacturing, the Stratasys TPU 92A Elastomer is designed to meet the needs of manufacturers requiring high part elongation, superior toughness, and full design freedom. With hands-free soluble support, the solution can significantly reduce both production time and labor costs. “The new Stratasys 92A is a compelling material for our consortium members because when combined with water soluble supports, it will provide them with the opportunity to produce medium to large, complex, durable and resilient elastomeric parts that were previously not feasible,” said Vince Anewenter, Director of Rapid Prototyping Consortium, Milwaukee School of Engineering. Further advancing realism for 3D printed prototypes, Stratasys also announced a range of new materials for its J750 and J735 PolyJet 3D Printers. These enhancements include five new materials with an ability to mimic rubber, leather or plastic. These highly realistic prototypes are designed to enable teams to better meet specific design objectives, streamline iterations, and shorten time-to-market and time-to-revenue. The Agilus30 White material can mirror such parts as rubber-like seals and gaskets for automakers – or vividly colored models used for prototypes in sporting goods, consumer electronic components, or toys/figurines. Mixing both rigid and soft materials, Agilus30 White produces the widest range of life-like prototypes on a single printer. The newest member of the Agilus family of colors that includes translucent and black, Agilus White creates the highest levels of detail – critical for such industries as healthcare, where true white is necessary for such applications as medical devices. VeroVivid Cyan expands the J750 and J735 gamut to more than half a million distinguishable colors – encompassing rigid to opaque, flexible and transparent. Producing vibrant colors and translucency in a single print, VeroVivid Cyan and the new VeroFlexVivid engineer effective, realistic prototypes for such markets as consumer goods, packaging, and eyewear. Supported by enhanced GrabCAD Print color profiles, designers can actually “print what they see” with enhanced color accuracy. Delivering on previously announced roadmaps, Stratasys is now making its PEKK-based FDM thermoplastic – Antero800NA – available on F900 3D Printers. This high-performance material is chemical resistant, possesses ultra-low outgassing properties, and exhibits high heat resistance – ideally suited for aircraft and space applications. MED625FLX is a bio-compatible material, well-suited for dental and orthodontic applications such as indirect bonding (IDB) trays and implantology case work ups. Now available on both Objet260 Dental and Objet260/500 Dental Selection 3D Printers, the material is designed to advance Indirect Bonding Trays by allowing the direct printing of flexible IDB trays, and is built to enable orthodontists to reduce bracket placement times up to 75 percent and cut the cost for labs to produce by 40%. More on the digital dentistry device market in the U.S. can be found in a series of reports published by iData entitled the U.S. Market Report Suite for Digital Dentistry Devices. The full report suite on the U.S. market for digital dentistry includes CAD/CAM systems, CAD/CAM materials and rapid prototyping systems. There is also an analysis provided on CAD/CAM software within the laboratory environment. The iData series on the market for digital dentistry devices covers the U.S., Japan, South Korea, Australia, China, India, Argentina, Mexico, Brazil and 15 countries in Europe including Germany, France, the United Kingdom (U.K.), Italy, Spain, Benelux (Belgium, Netherlands and Luxembourg), Scandinavia (Finland, Denmark, Sweden and Norway), Portugal, Austria and Switzerland. Reports provide a comprehensive analysis including units sold, procedure numbers, market value, forecasts, as well as detailed competitive market shares and analysis of major players’ success strategies in each market and segment. To find out more about digital dentistry device market data, register online or email us at [email protected] for a U.S. Market Report Suite for Digital Dentistry Devices brochure and synopsis.